Starting to snow, looks cosy! Simon set off on his own, accompanied by a clingy and worried Alex for the first 6km until it got too hilly and it was a fine excuse to turn back and let him continue on his own. He also borrowed a down jacket from our new Australian friend who assured him he wouldn’t make it without it. Managing to push as far as Pengboche on his first day, he felt completely fine. Clearly the Mallory method worked well and the previous days’ higher climbs had left their mark on him. 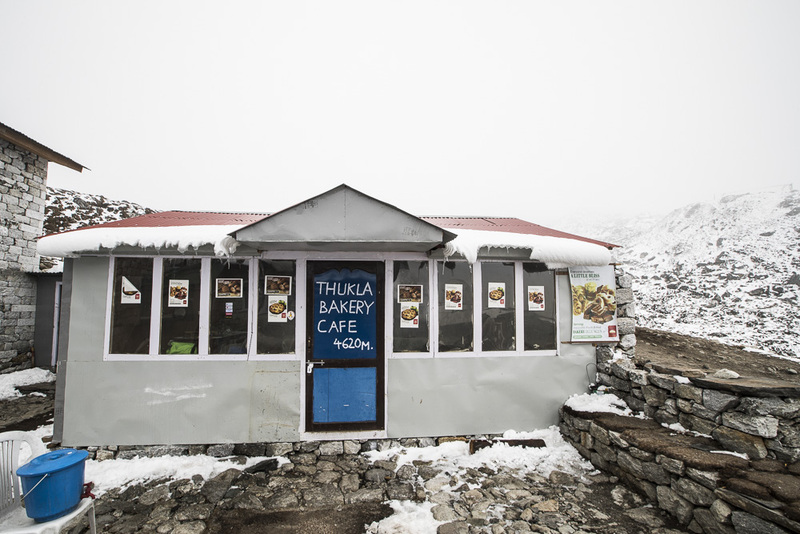 After an expensive night in Pengboche, he bypassed Dingboche and headed straight for Thukla where there was the customary bakery this time covered in snow and surrounded by thick fog. The whole path from Thukla onwards was plunged into thick fog which disguised the path and made the whole scene white and grey and disorientating. 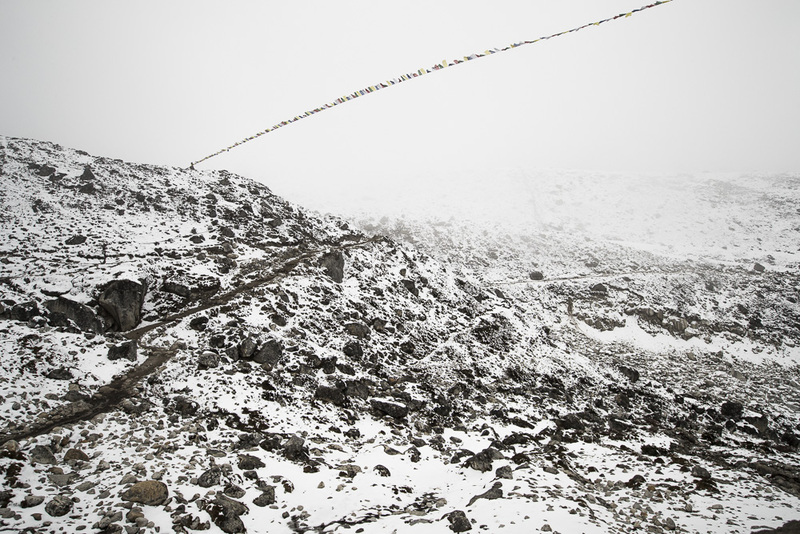 Even the prayer flags were desaturated, bleeding their colour into the bleak landscape and fluttering noiselessly in the wind. The whole area was desolate and lonely but Simon is nothing if not lucky and he made friends along the way. Bouyed by his new companions, he made it to Gorak Shep in record time. Luckily one of the group was extremely fast and made it before 10am, time enough to secure the last few bunks in a smelly dorm. The sheets of which hadn’t been cleaned since Tenzing Norgay had summited. Nevertheless, it was a bed and the alternative was to sleep outside in subzero temperatures. 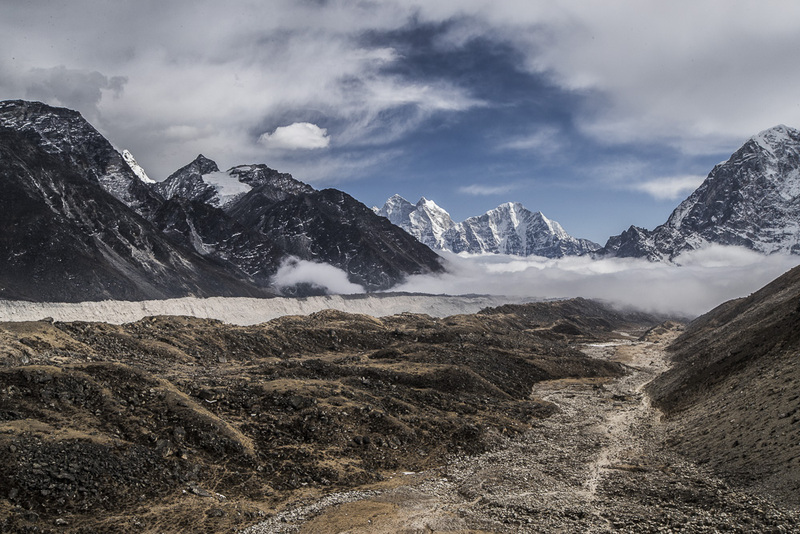 From gorak Shep, one can do a short trek to Kala Patthar which offers the best unobstructed view of Everest. 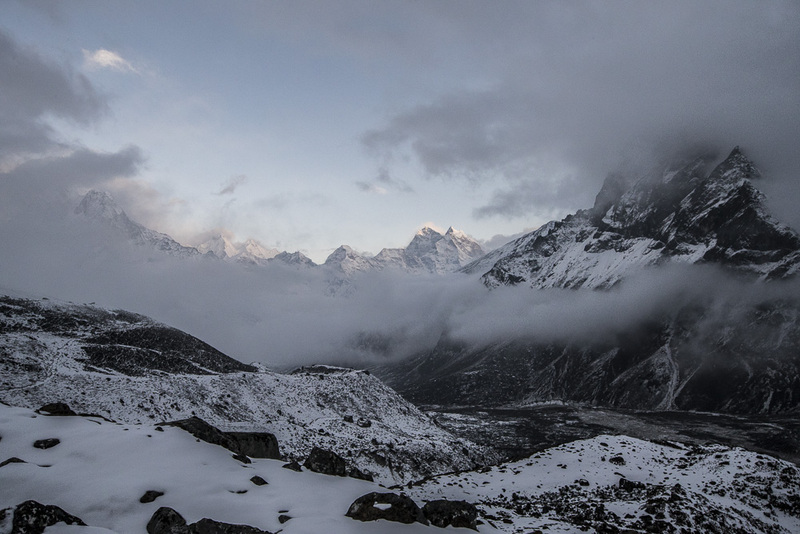 Simon trekked the few hours to the area and spent an hour before sunset climbing a really technical peak after a Nepali trekker had told him it was Kala Patthar. 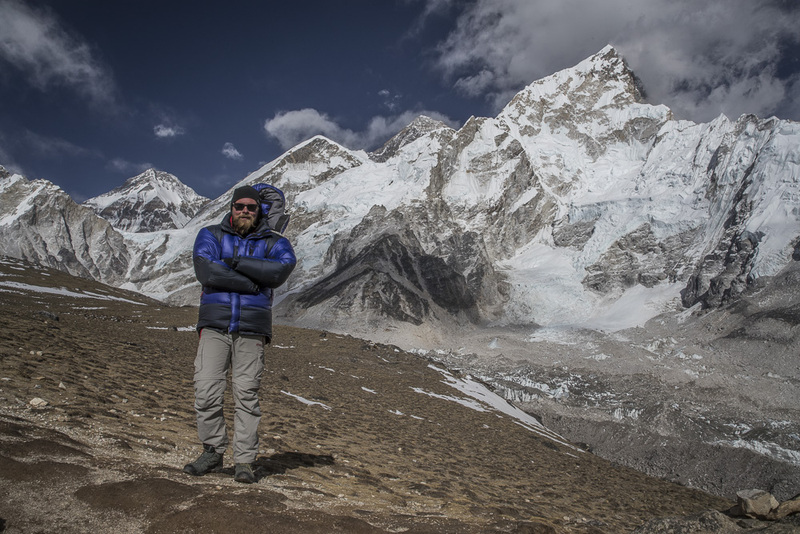 Once he reached the summit, it offered him a great view of Everest but also an exceptional view over the real Kala Patthar and all the trekkers who’d climbed the correct, easier, peak in the distance. 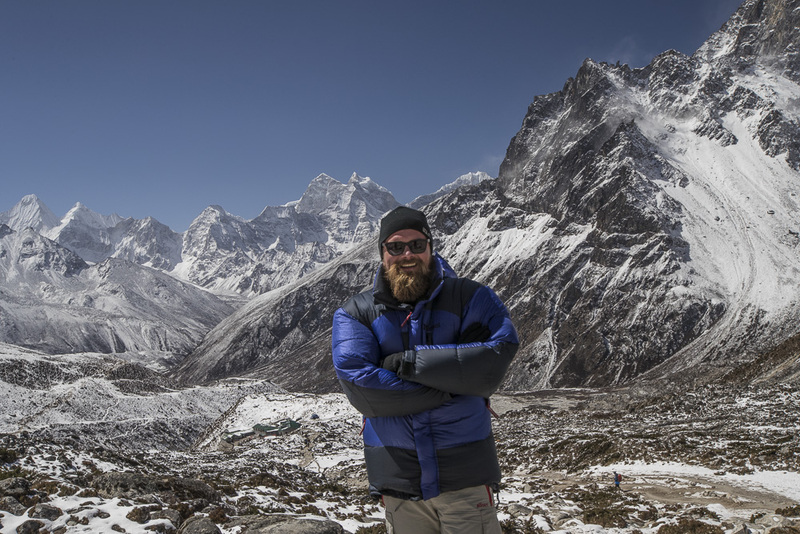 The trek was pretty rewarding and particularly for the second day when Simon trekked from Gorak Shep to Everest Base Camp. 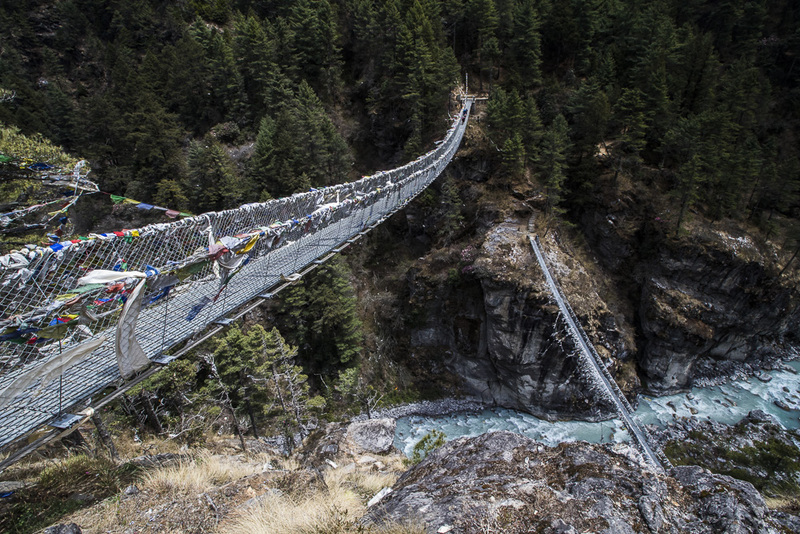 The morning was, as usual, chilly in a -20deg kind of way but it gave way to a sunny day and in the snowy, reflective ice bowl of Khumbu valley, it heated up to summer temperatures and people were trekking with only a T-shirt on! 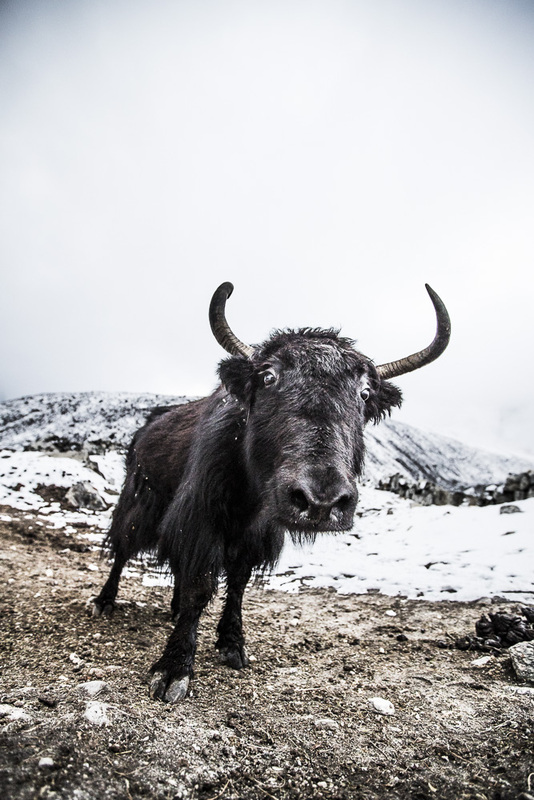 Simon met some friendly yaks on the way and once he reached base camp, he posed in the Khumbu ice fall- an icy glacier which is essential to cross to attempt any summit of Everest. 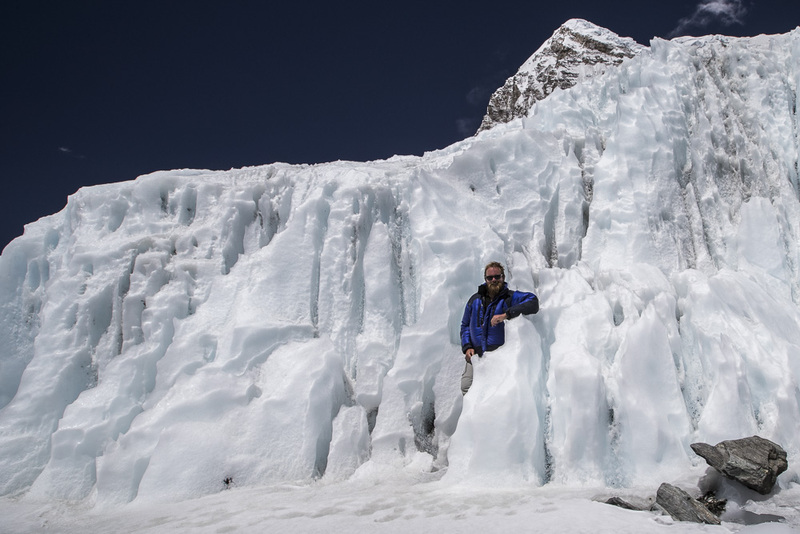 It is one of the most dangerous parts of the summit attempts and only a few years ago a number of Sherpas were killed when they crossed it at night (which is usual as during the day the ice is too warm to cross and is susceptible to falling over or crumbling as some of the blocks to cross are as high as 4-5 storey buildings). Everest offered her breath-taking views as usual. 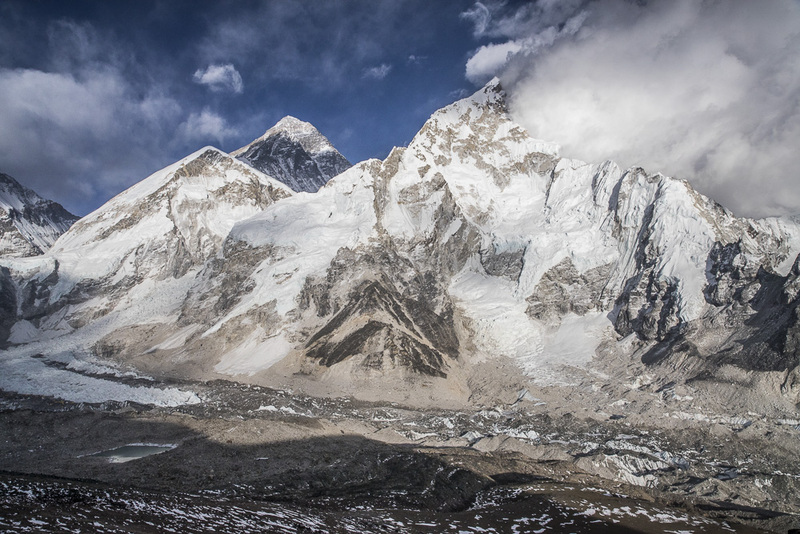 Although not the best-looking mountain in the region (if you can rate mountains by their looks) she stood proud hiding behind Lhotse and other neighbours. Funnily enough she is the only strangely grey mountain so is always easy to spot. And from the barren desolation of the area she rises, foreboding and stubborn in her majesty. 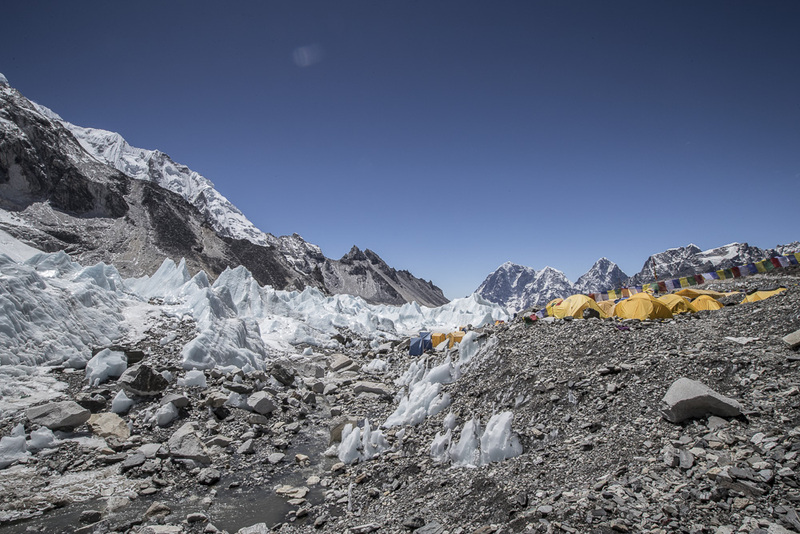 Base camp is only visible as a clump of orange tents at the base of the ice fall next to a plethora of prayer flags and offerings from previous summit hopefuls. 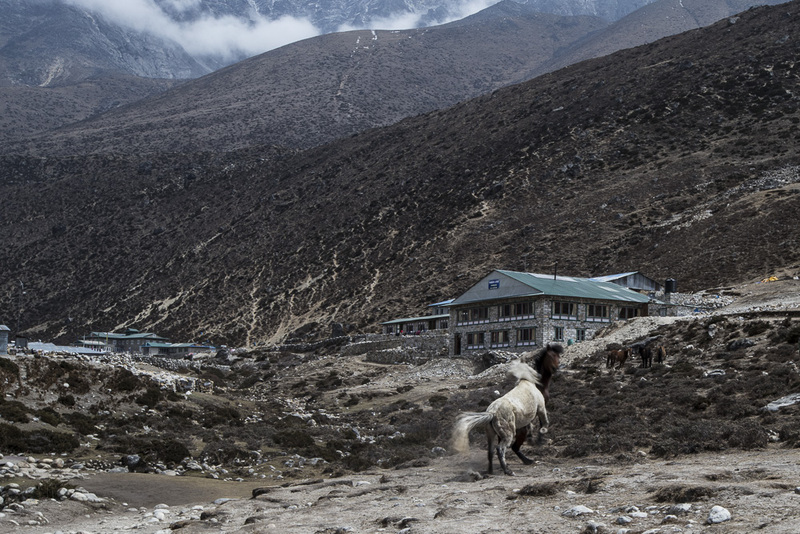 The scene is eerie, a makeshift village nestled in the unforgiving ice and rock of Khumbu, stark orange next to the cold blue and grey of the landscape. 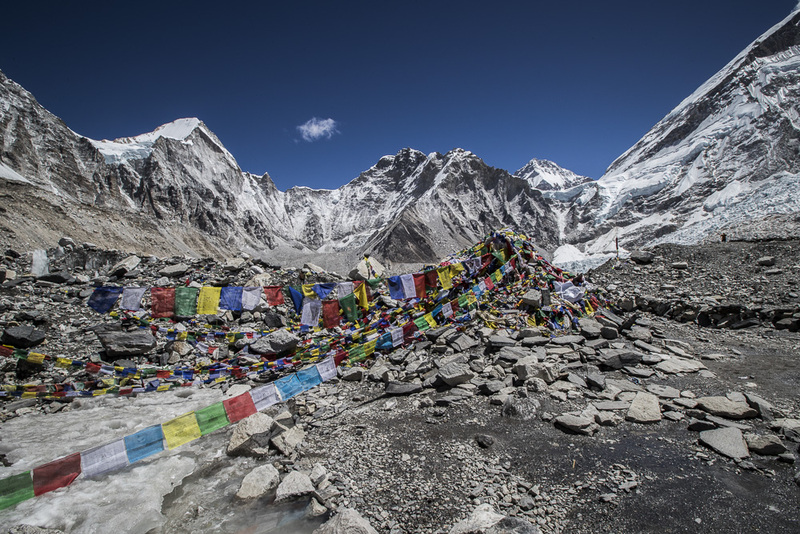 Base camp itself is a bustling community of enthusiastic climbers, trekkers, mountaineers, film-makers, adventurers and accidental observers. Some of the tents are huge with shelves upon shelves of the trekker-coveted Snickers and Mars bars. Like a nirvana of sorts after days of walking. Simon made friends with some Polish summit-attempters (more from them later) and after a few hours of relaxation headed back for his stinky bunk in Gorak Shep. The trek back was less arduous thanks to the training from the previous days. With new friends to keep him company, the road was shorter and Simon managed to walk all the way back to Namche Bazaar from Lobouche (usually a 3 day walk). 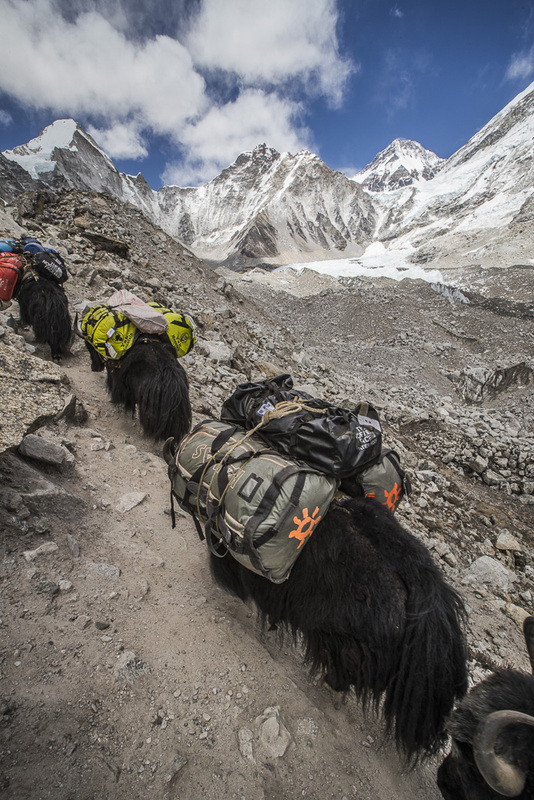 On the way he saw yak caravans, slowly swaying with their heavy footfall, determined stare and dingly bells under heavy packs destined for richer tourists and more adventurous summiters. One must jump out of their way otherwise they knock you over into the crevasses or against rock faces. The road to Thukla has no noticeable path, on the way up it was snowy so a footfall path could be made out but on the way back, in the bright sunshine, it was harder to make out the path amongst all the rocks. However, it was quite beautiful and a good excuse for a photo-break when the lower valleys were covered by cloud just ahead. Down in Periche, horses played in the late morning sun, running with each other before nuzzling and rubbing against each other. It was a moving sight for Simon but too quick to capture all the magic of the moment. Before long, Simon was back in Namche, surprising Alex during dinner (having arrived at 8pm, tired and adrenaline fueled from the walk). 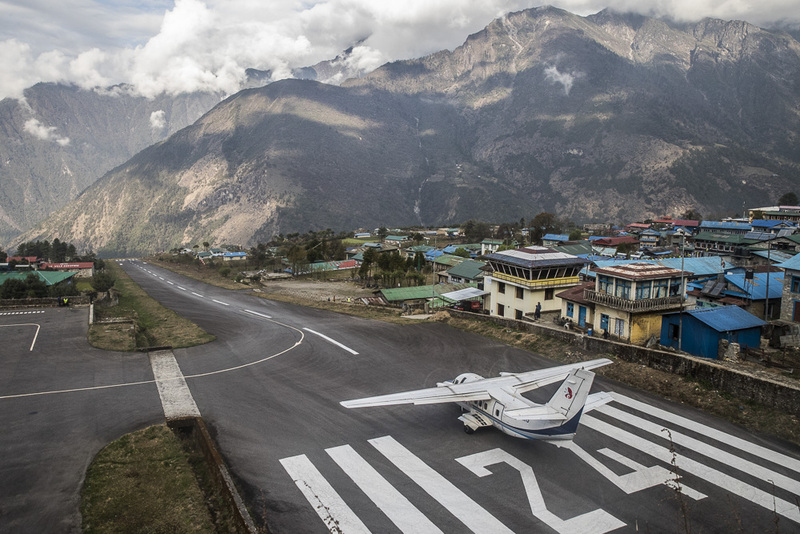 Then after a day off, rewarding Simon with an espresso, they set off together for Lukla and a hopeful flight back to Kathmandu. Now, our open return tickets had absolutely no times on them and no dates so we’re still not sure why he was so certain but still, we turned up at 9am, keen and now fed and watered from a nearby cafe. The crowd had grown even bigger with two queues growing from the check in counter, the 9am flight and 10am flight. Eventually, at 10am, both queues made it through the weigh-in and check-in process and we waited in the tiny waiting hall where a pack of Walkers costs £3 and Pringles, £5! The flights were all delayed although we couldn’t figure out why, eventually planes started to land at 10am and the crowd thinned. By 11:30am, both the 9am and 10am planes turned up and we all left. Crossing our fingers for a safe take off*, we wobbled off the runway safely en route back for Kathmandu, our trekking adventure over for this time! *We later learned that on the 30th May 2017 a Goma air flight crashed on landing and we sad to hear that both the captain and co-pilot died. Luckily, the 3rd crew member survived and it was a freight flight as opposed to a passenger flight so no further injuries were inflicted.